As the holiday shopping season enters its final stretch, the producers of "Miss Representation," the documentary film exposing sexism in American media, want consumers to use their buying power to fight sexism. The "Miss Representation" team wants shoppers to watch for offensive products that sexualize women and girls -- and Tweet about it. "If you see a product or ad during the shopping season that misrepresents or degrades women, use Twitter to post a description or upload a picture of the offensive item. 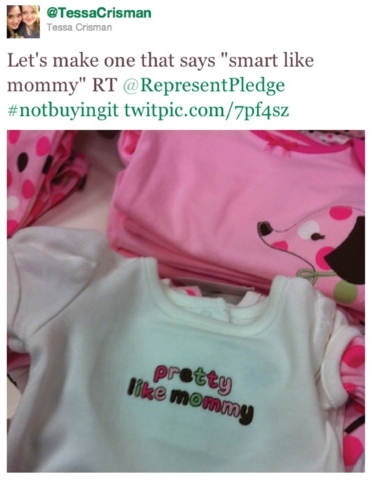 Use the hashtag #notbuyingit so that we can all follow along!" The campaign can also be used to show toys and images that promote positive representations of women and girls. Images can also be posted on the film's Tumbler page. Susie Barr-Wilson posted this image from the Lego Friends collection launched by the company to broaden its appeal to girls clad in tank tops and miniskirts. She says, "The minifigures are built to hold hairbrushes and handbags, they’re designed in pastels, and one of their building sets is a hairdressing salon. While I applaud Lego for recognizing that girls like to build just as much as boys, perpetuating traditional gender stereotypes is NOT the solution to expanding their market. Create “girl” minifigures, sure, but why not make them astronauts or crime fighters (dressed in practical clothing for the job)? Or how about rock-climbers or world travelers on safari? A company of such popularity has great potential to defy patriarchal gender norms, rather than promote them. Nice try, Lego, but until you create “girl” legos that don’t endorse traditional femininity, I’m not buying them." Tessa Crisman Tweeted this image at right of baby close that emphasizes the importance of being "pretty." "We have enormous power. Eighty-six percent of the purchasing power in this country is in the pockets of women. Well, let's use it."